Get online training on how NFPA 241 compliance helps you ensure adequate fire protection during building construction, alteration, and demolition. Gain a basic level of understanding about safeguarding construction, alteration, and demolition services -- so you understand how to provide a safer work site through compliance with NFPA 241: Standard for Safeguarding Construction, Alteration, and Demolition Operations. This important Standard provides measures for preventing or minimizing fire damage to structures, including those in underground locations, during such activities. Work at your own pace to learn how NFPA 241 works to reduce liability and the risk of fire loss. Buildings in the course of construction have many additional fire hazards not found in completed structures. Fire protection equipment to restrict the spread of fire and extinguish it promptly has not yet been installed. Fires are often difficult to access by the fire department. Every opportunity exists for serious fire loss. NFPA 241 is unique in that it's not a "brick and mortar" standard but one that governs the process of putting the 'brick and mortar" in place. The Standard ceases to apply when the building is completed. 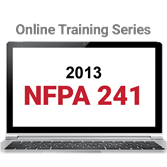 This online training program teaches you how to locate, interpret, and correctly identify and apply the requirements in the latest edition of NFPA 241. Complete this three-hour course series and qualify for 0.3 CEUs. Upon successful completion of all modules, participants will be prompted to download the CEU certificate directly from the course site.